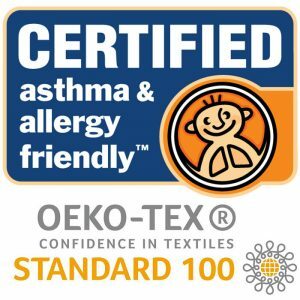 Allergy Standards Ltd. (ASL) announced today that they will accept OEKO TEX® Standard 100 certification as a pre-qualifier for the chemical assessment portion of its textile standards for asthma & allergy friendly® certification. Ability to block passage of allergen. Exposure to allergen is considerably reduced when mattresses, pillows, comforters, quilts and duvets are encased within allergen impermeable barrier fabrics. Eradication of dust mites and associated allergens following recommended washing instructions. This is tested following infestation in an environmentally controlled chamber. Quality of the product. A repeated wash test is carried out to ensure the product can withstand the routine washing of bedding items that is required for those with asthma and allergies. Chemical content and VOC emissions. The materials are assessed for the presence of potentially harmful substances such as azo dyes, allergens and irritants. Volatile Organic Compound (VOC) emissions are tested, as VOCs can be a trigger for asthma and allergies. OEKO TEX® Standard 100 is a globally recognised testing and certification system which excludes or strictly regulates the use of possibly harmful substances in textiles in the framework of extensive laboratory tests. ASL have reviewed the standard and its criteria and methods, and has concluded that textiles that have active OEKO TEX® Standard 100 certificates under Class I Appendix 6 would not need to undergo further chemical testing for asthma & allergy friendly® certification, and that for textiles that have active OEKO TEX® Standard 100 certificates under Class I Appendix 4 the only chemical testing requires for the ASL certification is VOC emissions testing. This will broaden and facilitate the pathways to ASL certification for textiles companies with existing OEKO TEX® certification. It will also ensure that the rigour and comprehensive coverage of the asthma & allergy friendly® certification is retained and reinforced. ASL Chief Executive Officer Dr. John McKeon is in New York this week at Home Fashions Market Week, meeting with existing clients of the Certification Program such as Hollander Sleep Products, Downlite, Allied Home, Welspun, Indo Count, AQ Textiles, Smart Silk, Luxeport, Wicked Sheets, Protect a Bed, National Allergy, and Springs Global. Allergy Standards Limited (ASL) mission is design thinking and an innovation for healthier indoor air for the allergy aware consumer. As an independent, international certification company, it creates meaningful scientific standards for testing a wide range of products and services to determine their impact on improving indoor air quality. ASL’s intellectual property portfolio includes unique testing protocols and suitability specifications for products to be CERTIFIED asthma & allergy friendly®. ASL’s mission is to improves lives by empowering people create the healthiest possible indoor environment through science, education and innovation.